For learning a second language, a language environment of that language is very important on learning for almost all languages. The verbal part of a language not only is a great memory anchor for learning the written part of that language but is, often, non-separable from that written language. Chinese written language is, perhaps, the only exception from the above law. The Chinese verbal language helps very little on the learning of Chinese written language. In fact, 50% of native Chinese middle school graduates cannot write a comprehensive essay smoothly, and 85% of native Chinese college graduates cannot read Chinese classic writings easily. Thus, Chinese written language was and still is viewed as one of the most difficult written languages to learn. On the contrary, Chinese verbal language could be one of the easiest verbal languages to learn. In general, almost everyone can speak Chinese verbal language as the second language with ease after in that language environment in one year. Yet, the illiterate, by definition, is one who is able to speak and to listen but unable to read and to write. However, the recent works of Jason and Henry have changed a 5,000 year old known fact and have proved that Chinese written language is, in fact, the easiest written language to learn in the world. Chinese written language can be learned not only without a language environment but without learning the verbal part at the same time. Thus, the curriculum on learning Chinese language can be divided into two parts, the verbal and the written. 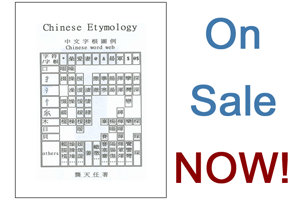 Although the Chinese verbal language is much easier than to learn speaking English (at least 50% easier), this Chinese-Etymology program will begin with learning the written language first (without learning any verbal parts), as it is easier than high school geometry or chemistry. This is a 200 hour program which allows the students to gain the ability to read current Chinese newspaper from an initial state of not knowing a single Chinese word. This 200 hour can be divided into four stages. Learning the Chinese word form — 30 hours. After 30 hours, students should be able to duplicate any Chinese character (however complex it is) with handwriting after glancing it for 10 seconds. This lesson can be learned by any fourth grade (or up) American student. Learning the Chinese word meaning — 100 hours. Learning to dissect 1,200 Chinese characters (Generation one words) — 20 hours. This lesson can be learned by any 4th grade student who has mastered the previous lesson. The sound of those sound modules — 0 hour, students must not waste time on this at this point. The dissection and the decoding of those 300 sound modules — 30 hours. The decoding of 1,200 G1 words (re-dissect them first) — 30 hours. The checking of your decoding results — 20 hours. Students should learn the use of a traditional Chinese dictionary (sorted by leading radicals, not pin-ying dictionary please) to help of verifying the decoding results. At this point, students should have learned over 2,000 Chinese words (characters) while they should feel at ease for all (58,000) Chinese words. These lessons can be learned by any 4th grade student who has mastered the previous lessons. Learning the Chinese vocabularies — 50 hours. Although all Chinese words (characters) have meaning, the meaning of a Chinese written sentence is, often, composed of and by vocabularies which are word phrases (composed of 2 or more words). Learning 2,000 commonly used two word phrases — 20 hours. As the meaning of word phrase is coming from its composing words, this is an easy lesson when students have mastered the knowledge of words (characters). Learning 1,000 commonly used four word phrases (idioms) — 20 hours. Learning to demarcate the Chinese phrases in newspaper — 10 hours. Practicing to read Chinese newspaper — 20 hours. Learning the Chinese verbal language — this part goes beyond this 200 hour program. Learning the sound of 300 sound modules — 20 hours. Learning the 4-tones of those 300 sound modules — 20 hours. At this point, students can discern 70% of all Chinese sounds. Learning the daily conversation — unlimited. Although the verbal part of lessons can be mixed in with the written language lessons, it is strongly recommended of not doing so with the lesson 1 and 2 (the first 130 hours) for two reasons. These two lessons can be mastered without the verbal part, as all word roots are silent in their composed words. Learning the verbal in these two lessons will cause a serious distraction and is a wasting of time on the objectives of those lessons. However, if for any reason (regulation, standards or else) that verbal part must go together with the written part, such a verbal / written curriculum can be easily designed. Furthermore, although the sequences of the written part lessons must be followed, each lesson or segment (sub-lesson) can be studied alone. That is, they can be easily spread across school semesters or years.